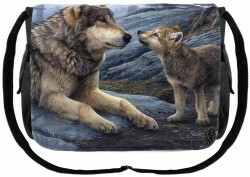 Brother Wolf artwork by Daniel Smith featuring an adult wolf watching over a cub. Cotton Bag with artwork printed on a leatherette cover. All messenger bags have 5 pockets and a zip sealed inner compartment with adjustable shoulder strap. Max strap length: 125 cm. Bag width = 40 cm (16 inches). Height: 27 cm.